Correction: It has come to our attention that the wrong blog article was posted on 2/1/12. Our apologies to Linda for the mix up. I like hope. It is my nature to hope. In the face of almost anything, I am looking for hope. 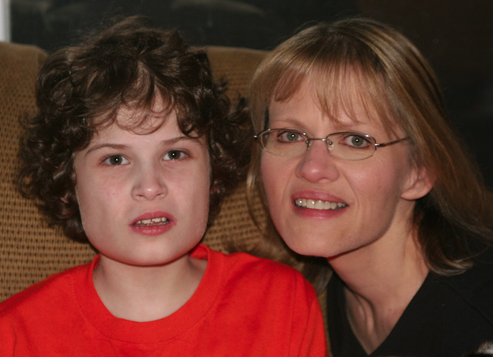 In my fourteen-year autism journey, hope has become my constant companion. It gets me out of bed in the morning. It sustains me. So what is hope? How do we get it? How do we hang on to it? I think hope is simply the belief that tomorrow can be better than today. I find that hope is born when we can see a path, a series of actions that can potentially lead us to that better tomorrow. Once we understand that the actions we take can change the lives of our children, there is no suppressing hope. There is no room for delusion in hope. We aren’t wishing on a star or simply crossing our fingers. With eyes wide open, we follow the research and educate ourselves, which is what reveals to us that path leading to a better tomorrow. With a vision and a plan, hope is born. We choose therapies and strategies that have proven themselves. We choose clinicians with experience and good reputation. We choose physicians who understand autism for the medical condition that it is. We have our children evaluated medically and treat what we find. As a result, our kids get better; some even recover. Once we see our children feeling and functioning better, hope breeds more hope. It becomes impossible to stop hoping. Within TACA we often say that the autism journey is a marathon, not a sprint. As most of us know, it takes time to heal the body of this complicated, multi-system, metabolic mess we call autism. Hope fuels us and is essential to completing this marathon. But what happens when it becomes hard to hope? My son is the kid that the doctors in our community call the “tough nut.” He’s sixteen years old now, and we’ve broken the bank multiple times over the years doing everything we could to help him feel and function better. There have been different diets, scores of supplements, injections, EEGs, endoscopic procedures, pill cam studies, MRIs, lumbar punctures, muscle biopsies, helminthic therapy, IVIG treatments, and, of course, countless hours of speech therapy, occupational therapy, and Floortime. My son is still nonverbal and still very self stimulatory. He lives with a great deal of pain, mostly gastrointestinal pain, and in the last few years he has been dealing with frequent migraines. He often can’t sleep because he is just not comfortable in his own body. He is very self injurious when he’s in pain and sometimes aggressive. 2011 brought us three hospitalizations and three visits to the emergency room, all related to his gastrointestinal issues. I find that as a mother, the self-injurious and aggressive episodes are the most painful thing of all to endure. Pain breeds fear, and fear will crush hope. There are tear-filled, sleep-deprived moments when hope all but dies. So how do we hang on to hope? How do we bridle the fear and give the reigns back to hope? It helps me to take a mental journey back to 1998. My son’s diagnosis was May 1, 1998. I remember that day vividly right down to the clothes I was wearing. But mostly I remember feeling like the earth had stopped turning on its axis, like there was no gravity, and that nothing would ever be the same again. I was filled with fear, not having a clue what this diagnosis would mean in reality for my son or our family. About six months after the diagnosis, the six most anxious months of my life, we became aware of the GFCF diet. The diet helped my son; some of the “fog” lifted for him. We also learned that some parents were using magnesium and B6 and seeing improvements. Other parents shared with us that probiotics and digestive enzymes were helpful. Another parent recommended a nutritionist out east who was helping children with autism. In November of 1999, we heard the secretin story on the news one night. In 2000 mercury, thimerosal and chelation exploded onto the scene. The earth did keep turning on its axis, and more and more became understood about the biology of autism over those next few years. New treatments were theorized and tried: IVIG, methyl-b-12, HBOT, auditory training, listening therapies, Rapid Prompt Method, PROMPT technique and more. In recent years the role of mitochondria in relationship to autism has been studied, shedding more light on the medical issues related to autism. Most recently cerebral folate deficiency and the role of autoantibodies to folate receptors has come to the forefront of autism research. As a result many children have added leucovorin to their treatment plan, and the benefits have been substantial. I said all that in order to say this: I look at the past, and it’s full of discoveries and advances in treatment for our kids. My neurotypical daughter is a physics major in college, so we are fans of Albert Einstein at my house. He said a lot of interesting things in his lifetime, and many of them had little to do with quantum physics. In one of my favorite quotes he said, “Learn from yesterday, live for today, hope for tomorrow. The important thing is to not stop questioning.” Our yesterday includes fifteen years of research that have resulted in many new treatments for our kids. And because we won’t stop questioning, I have hope for tomorrow. Many of our kids still have a long way to go. We don’t know everything yet about how to prevent or reverse autism. There is more yet to be discovered. So while there are days when I feel like we have done it all for my “tough nut.” I don’t lose hope. I believe that the next fifteen years will be as full of new developments as the previous fifteen. I have very real hope for tomorrow. What else can we do to sustain hope and motivate us on this path? Don’t go it alone. Surround yourself with like-minded parents and professionals who will encourage you in the tough times and celebrate with you when your child makes progress. Get involved in local autism groups where you can learn, share information and stay connected to other parents on this autism journey. If you are lucky enough to live near one of TACA’s 25 chapters, you can attend TACA meetings and Coffee Talks in your area. TACA families are a great source of support, information and inspiration. Stay connected with other parents on this journey via the internet, through facebook, meet-ups and yahoo groups, like TACA-USA. If possible, attend conferences where you can hear the latest research, talk to the doctors in person, and compare notes with other parents. TACA has developed really useful tools and programs to make this journey easier for us as parents. The TACA website is loaded with information on almost every imaginable topic related to autism, including a fantastic series of articles giving parents strategies to save money and do “autism on a budget.” The “TACA Autism Journey Blueprint” can also be found on the website; it’s a step-by-step plan for the first three years after diagnosis, including internet links giving more information about each step along the way. Take advantage of the live chat feature on the TACA website which enables parents to ask a question and get help in the moment. TACA’s Parent Mentor Program gives families access to a group of experienced, trained, supported parent mentors who are available to help parents navigate this autism journey. It’s an amazing opportunity to get one-to-one help from another parent who’s been on the autism journey for a few years and can share his or her experience and resources. To get a Parent Mentor, read the program guidelines and submit the application on the TACA website. If you feel ready to help another family, you can also find the information you need to become a TACA Parent Mentor on the website as well. It’s completely exhilarating to use what you’ve learned along the way to help another family find real hope and see their child feel and function better. One more thing is important to hope, and it often goes unrecognized. It’s you. Yes, you. You’ve got to take care of yourself. It’s exhausting to do what we have to do every day — cooking for the diet, running to therapies and doctor appointments, giving supplements, internet research, not to mention taking care of other children, keeping a marriage together, and working outside the home. Hope motivates us to attempt this herculean task, but a chronically exhausted, overwhelmed person can not mentally sustain hope. This autism journey is a marathon, not a sprint. So pace yourself. Eat well, try to exercise a bit, and get some sleep. Get some time away from autism in whatever way is meaningful to you — see your friends, have time with your husband and other children away from autism, read some fiction, get your hair cut and read a copy of People Magaaine, take your dog for a walk, or sit in a warm lavender-filled bath when everyone is asleep. Just make sure you take care of yourself, too. I was sitting with my son’s physician before writing this article, and I asked her, “What would you say to parents about hope?” She thought for a moment and said, “Well, what’s the alternative?” Without hope, what’s left? Despair. Despair paralyzes people. Despair says you can’t make tomorrow better, so why try? It takes a lot less energy to engage in despair, but it’s a lie. There are scores of dietary, medical, therapeutic and educational interventions that have proven to help our kids. Despair has nothing to do with reality. Despair is just not logical. Educating yourself and taking action is logical. Hope is real. So what’s next for my “tough nut” kid? There are days when I feel like we’ve done it all for him. But, guess what, we haven’t. I just found out he is severely growth hormone deficient. Like any good autism mom, I have been googling human growth hormone. I learned some amazing things. Growth hormone does much more than make your skeleton grow. It has a role in healing and tissue repair. It has a role in methylation. It is also an immune modulator. Who knew? So next on our list is human growth hormone injections. I am hoping for big things. And I hope I never stop hoping. Linda, I could relate to every word, but could not have said it so well! Thanks so much for striving and inspiring us and sharing your insight! Dearest Linda: I adore you. You signify the word hope. Beau is so fortunate to have you on his team. Dearest Beau: We won’t stop looking for answers. We love you. For families out there wondering if hope exists – it does. It is real. Keep hoping because answers are out there. Exquisite article Linda – so perfectly stated and so graciously appreciated. My son will be 16 years old in April and your words and experiences mirror ours. We, too, continue to move forward with nothing but great and realistic hope for our son’s health and well-being. His life matters way too much to follow any path but this one. Linda, this is so beautifully written, and expresses so well the life we live with autism. I will save it, and savor it, especially on those rough days when hope is just a 4 letter word. Thank you so much for putting these feelings into words. Thank you everyone for reading my post on Hope. I hold these thoughts close on my rough days, and I’m glad if these words lift another parent’s spirit and help him/her through a dark moment. We learn more every day. Hope is real. We are in this together. Wonderful article, many of the things you wrote abaut we lived in the last 8 years. Thank you!! Always hopping! !